It's a gaming slash video and photo editing PC, so I went all out, and paid top dollar for it (4 years ago now?). In fact I just spent another bunch of money upgrading it recently. It's my main hobby, so I like to keep it up to date. I put a EVGA GTX 980 Ti in it and doubled my RAM a few months ago. It was actually about a month before NVidia announced the new 1000 series cards... because that is usually how my luck with that goes. we can totes be friends! I chose FreeNAS because it is quite simply, in a league of its own. It was relatively cheap to setup and I've never had issues with it. In fact, someone took my USB (hosting the FreeNAS OS) out and reformatted it; I was able to recover my system in under 15 min without any data loss. There are alternative ways of storing data long-term, such as: more expensive storage mediums that will last longer but will, inevitably fail one day or cloud services which are pricier and obviously a security concern. I would recommend FreeNAS to anyone who is interested in this; please don't confuse FreeNAS with FreeBSD or CentOS that also use ZFS. FreeNAS has a whole bunch more in there. 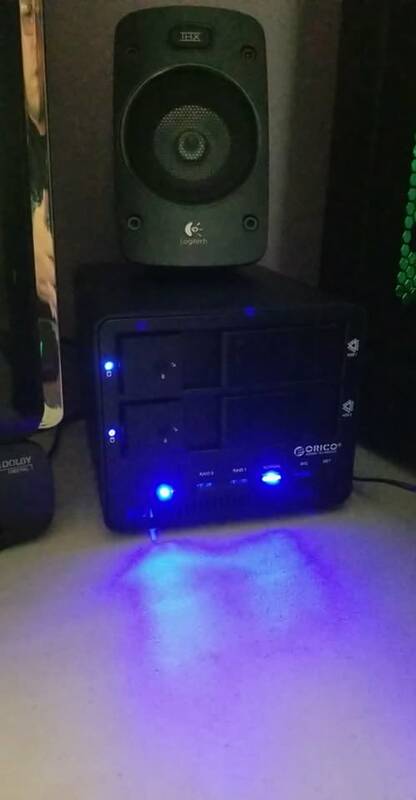 OK so I got an Orico USB external drive enclosure, and also got a couple new HDDs, one WD Blue 1TB SSD and a WD Black 4TB. As it turns out, my old storage drives seem to work fine and come back with no errors when I used them in the external drive enclosure, so I went ahead and ordered a 2 bay one with fan cooling. So now, assuming my two old drives continue to work, I will end up with 1.5TB of SSD storage on three drives, and near 10TB of storage space on regular HDDs.